It was Posner’s decision that first allowed states to return to the Jim Crow vote suppression tactics that we thought had vanished with the passage of the Voting Rights Act. Sorry, Your Honor, you’re still going straight to Hell. For fibbing. Judge Posner’s excuse at the time he ruled: a voter ID law would prevent fraudulent voting, someone voting under someone else’s name. 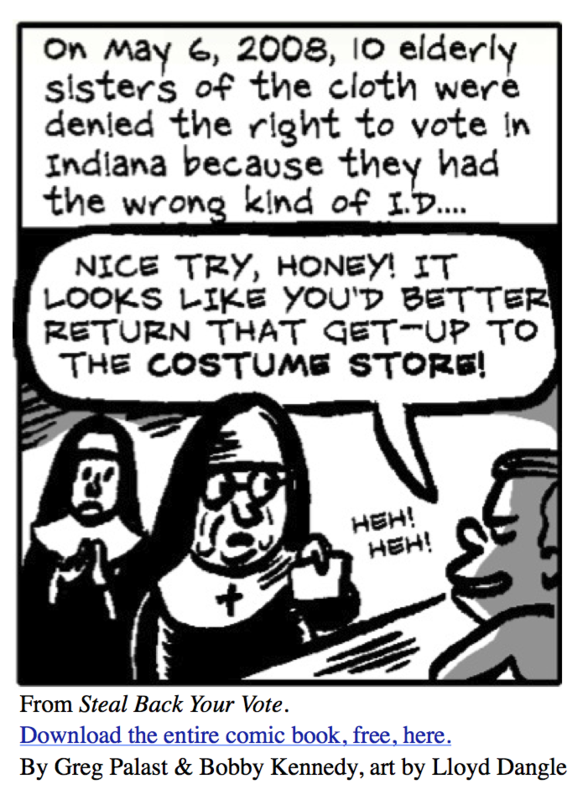 But, Your Honor, you were told that, in a review of records going back 100 years, Indiana had not discovered one single case of voter identity theft. I’m not saying he’s acted as Satan’s consigliere, but that’s only because I don’t believe in the Devil. Evil is human, often humans with professorships. While famed for giving Constitutional color to Indiana’s Ku Klux voter ID law, Posner’s real influence was in his judicial review of the regulations on business. Posner and the so-called “law and economics movement” was violently hostile to virtually all regulation, from food and drug safety to the minimum wage. Pollution laws? Eliminate them all! Looney, yes, but Posner’s acolytes and movement fellow-travelers soon ruled the federal bench, appointed, like Posner himself, by Ronald Reagan. Look, I don’t care if Professor Posner can save his soul by recanting a lifetime of professorial gibberish and horrific rulings. What’s important to understand is the nexus: attacking voting rights, attacking worker and consumer rights, are of one piece: the right-wing free-marketeers deep-rooted distrust of democracy. Well, Judge Posner, I’m always suspicious of a robed Torquemada who believes that corporate “persons” have civil liberties but person-persons have none. 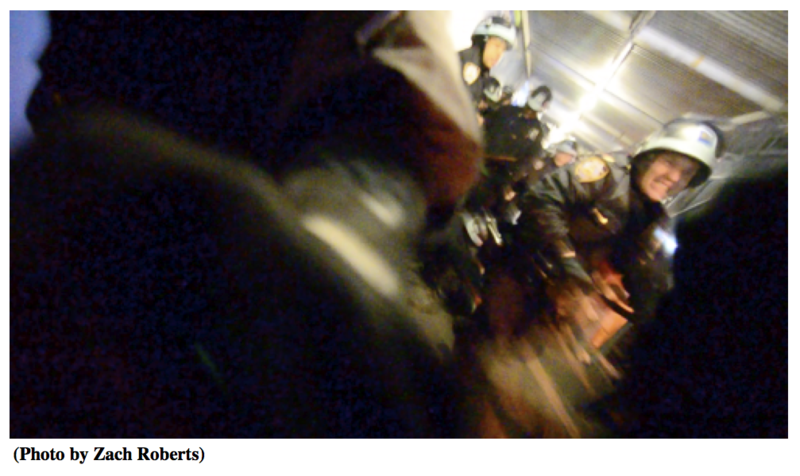 I’m sure Judge Posner would have been thrilled to see the police “do their business” on Zach Roberts, our Palast team photographer. Here’s a photo Zach took at Occupy Wall Street just as a police baton was coming down on his head–and on our camera.Unfortunately, former Chicago law professor Barack Obama clearly took a little too much Posner with him to the White House, as we see in the charges against Bradley Manning and Edward Snowden and in the witch-hunt for “leakers” that makes Richard Nixon look like Thomas Jefferson. 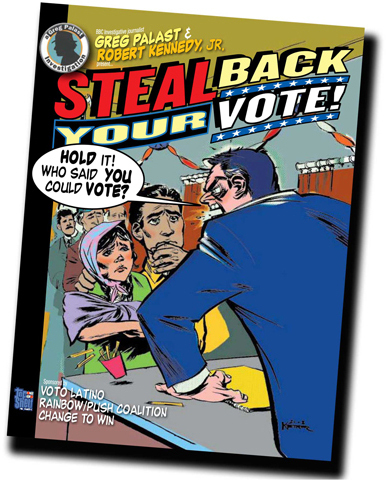 Greg Palast is the co-author with Bobby Kennedy of the comic book Steal Back Your Vote and the treatise on deregulation, Democracy & Regulation, with Jerrold Oppenheim and Theo MacGregor, winner of the ACLU’s Upton Sinclair Freedom of Expression Award. Greg Palast is also the author of the New York Times bestsellers, Billionaires & Ballot Bandits, The Best Democracy Money Can Buy, Armed Madhouse and the highly acclaimed Vultures’ Picnic, named Book of the Year 2012 on BBC Newsnight Review.